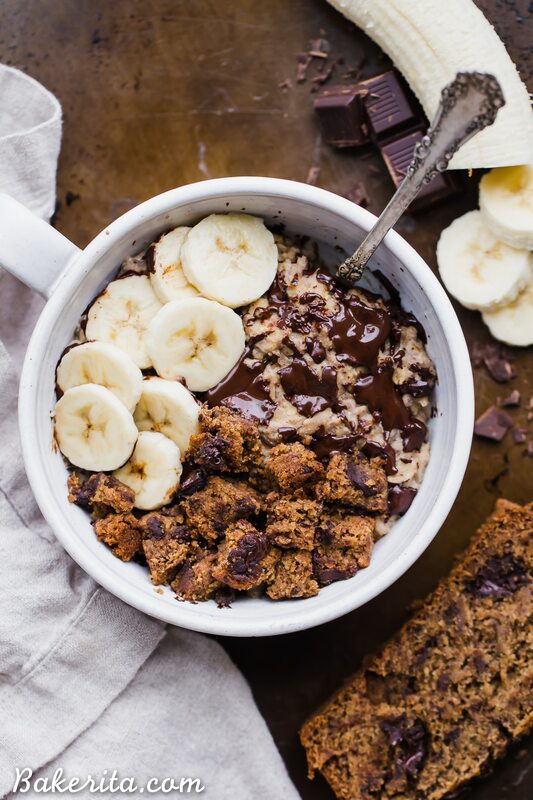 This Banana Bread Oatmeal is sweetened with JUST a ripe banana – no additional sweetener needed! It’s loaded with cinnamon and tastes like a creamy version of banana bread – what more could you want?! This easy breakfast recipe is gluten-free and vegan, too. If you’ve been watching my stories on Instagram for any amount of time, you’ve probably realized my breakfast OBSESSION with oatmeal. It’s usually in the form of this chocolate strawberry oatmeal, piled with lots of extra berries and seeds and a big scoop of nut butter. YUM. I’m coming at ya with my latest variation on this fave though. The idea came to me while I was making a batch of banana bread (testing a new VEGAN recipe that’s coming at ya soon ) and simultaneously craving my morning bowl of oatmeal. 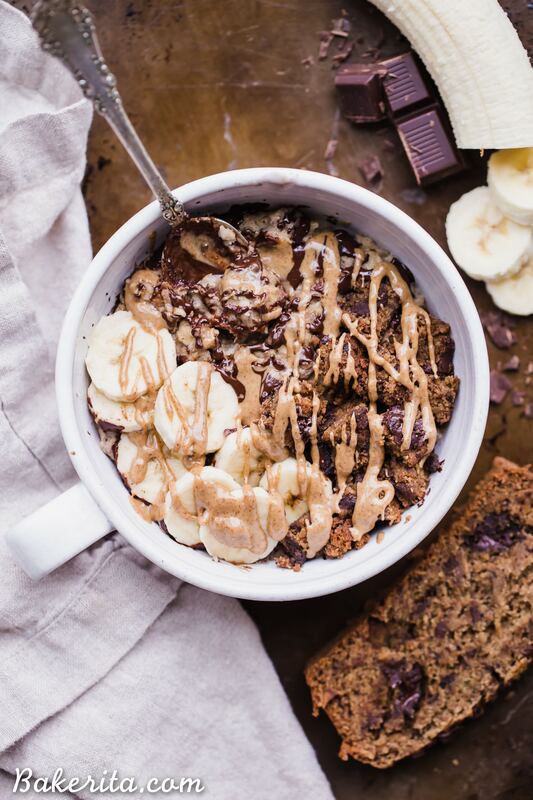 And when worlds collide…we get BANANA BREAD OATMEAL. Oh yes. It’s so good. Just as good as you’re imagining in your head right now. And like all my other oatmeal recipes…NO SWEETENER ADDED (or needed). Bananas do the hard sweetening work here and also add flavor – double duty! I always start by mashing the banana up in my pan and letting it cook for a little bit to soften up and sweeten up a little bit – I learned this trick for my sister Shaina, who has been making banana sweetened oatmeal since forever. Along with oats and almond milk (or your dairy free milk of choice), cinnamon adds that warm flavor and chia seeds add some extra fiber and bulk. Everything is simmered together until absorbed, and then time for toppings! 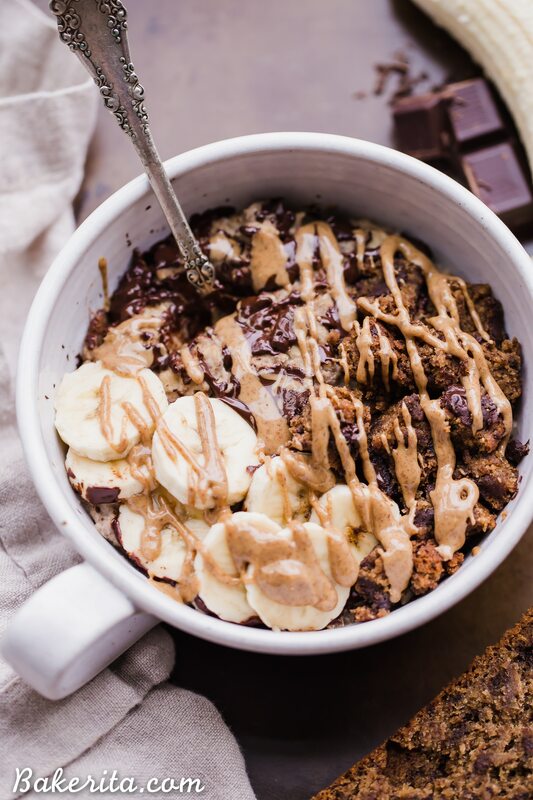 I was blessed to have a fresh-from-the-oven loaf of banana bread ready right when my oatmeal was, so my bowl was adorned with chunks of fresh banana bread in addition to the chocolate chunks, banana slices, and nut butter drizzle. A sprinkle of seeds would be great too – always into some extra crunch/nutrition :) and if you’re lucky enough to have banana bread on hand too, don’t forget to crumble a slice on top! You’re going to love this goodness, my friends. Enjoy! 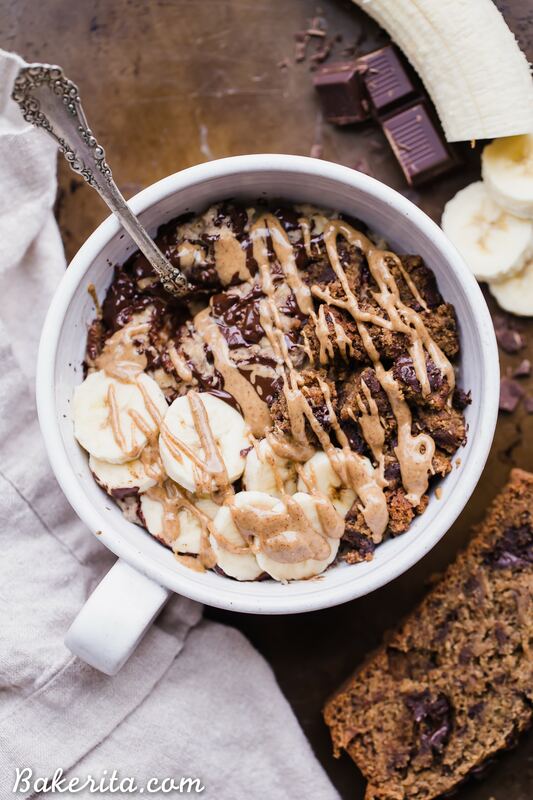 This Banana Bread Oatmeal is sweetened with JUST a ripe banana - no additional sweetener needed! It's loaded with cinnamon and tastes like a creamy version of banana bread - what more could you want?! This easy breakfast recipe is gluten-free and vegan, too. In a small saucepan, combine oats, mashed banana, almond milk, cinnamon, and chia seeds. Simmer until milk has absorbed into the oats, about 5-8 minutes, stirring occasionally. 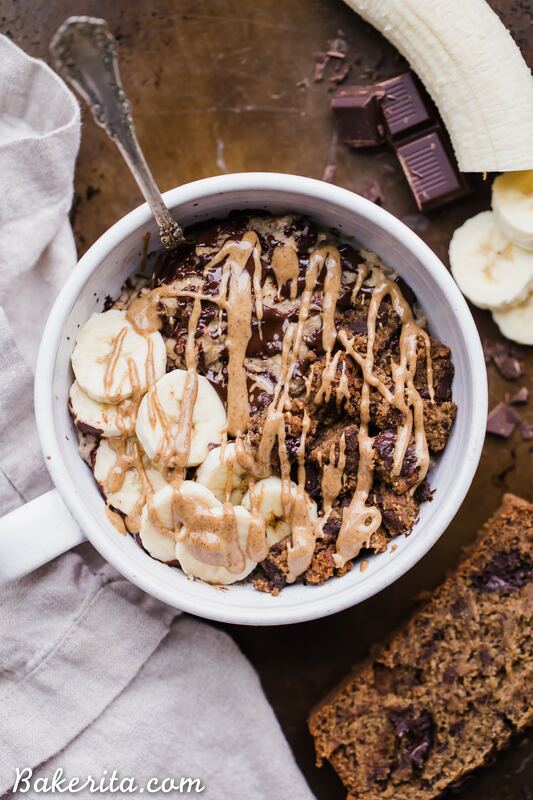 Place into a bowl and top with chocolate chips, banana slices, banana bread chunks, and/or nuts + seeds. Enjoy immediately! Can you make this in a big batch for the week, or not a good idea? What brand of dark chocolate do you use? Like for the toppings!